We're currently trying out three varieties of kale that are supposed to be particularly cold hardy --- Winterbor (from Johnny's and Territorial), Improved Dwarf Siberian (from Territorial), and Red Russian (from Sweet Garden Organics.) I planted three beds (each with all varieties) between August 6 and August 26, then covered them with quick hoops once cold weather came along. 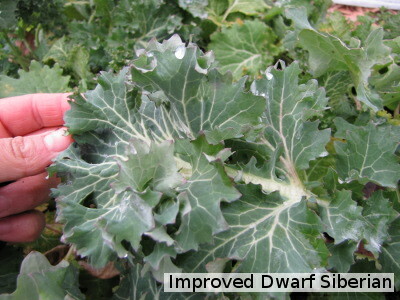 Despite its name, Improved Dwarf Siberian was the largest kale variety, growing a thick stem and long leaves that sprawled out over the bed. Red Russian turned out to be the diminutive cousin, keeping its growing tip near the ground and politely adding a new leaf to its topknot now and then. Winterbor looked a lot like Dwarf Siberian at first, but once the weather got cold, Winterbor started growing very ruffled leaves on short stems. My gut feeling is that Winterbor is still growing (perhaps because the condensed leaves are better able to handle cold?) while the other two varieties are biding their time until spring. I don't have any real data to back that up, though --- I only peek under the quick hoops now and then. 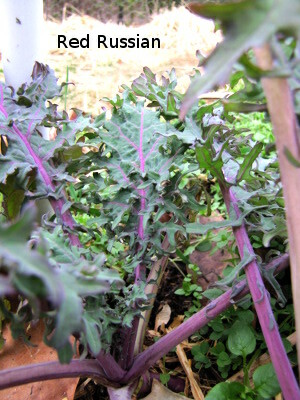 If I lived in the city, I'd plant all three of these kale varieties in my flower garden for winter color. Red Russian might be the prettiest, but the beautiful white veins on the Siberian and the ruffled Winterbor leaves are both quite striking. All three varieties of kale taste so good right now that when I go out and snip leaves for dinner, I eat a bunch before I get back inside. I've had to cut way back on the balsamic vinegar I saute them in --- the leaves are already so sweet that the sugary vinegar almost turns them into dessert. If I had to choose the least tasty variety, it would probably be Red Russian, but not by much. Only time will tell which variety lasts longest into the winter. This factor will probably be the most important in determining what we grow next year. 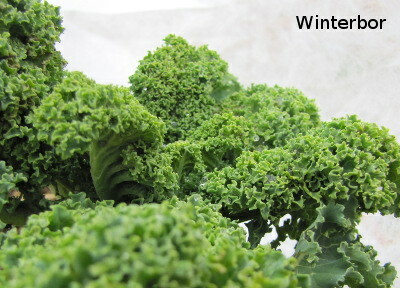 For those of you who aren't kale fans, I'll post a roundup of our other winter greens in another post. Our chicken waterer keeps the flock happy and healthy year round. I'm eager to see what your results for the whole winter will be. Are they actually growing or just maintaining where they were before it got cold? I don't have any kale growing, but I have several collard plants (in Maryland, so the weather is probably pretty similar to yours). They look beautiful, but the leaves are small and not enough to eat. If they are growing any it is too slow to see. While you leave the kale in the hoop house during the winter, do you have any ventilation set up. This is my first year with hoop houses and am wondering if i should set something up for ventilating during cold months. Tony --- I'll be posting something next week now that they've all thawed out. I didn't peek under every quick hoop, but the kale seems to be the least affected of everything so far. John --- These are actually quick hoops, not hoop houses. It's simply light row cover fabric stretched over PVC pipes a couple of feet off the ground. The reason I use row cover fabric instead of plastic is because it naturally vents on hot days and I don't have to ventilate. Hoop houses are whole 'nother ball game.